While LIC owns 13.93 per cent in PNB, 13.24 per cent in Union Bank of India and 13.17 per cent in Allahabad Bank, it also owns 2.88 per cent in Gitanjali Gems as on December 31, 2017. The Rs 11,400-crore banking fraud allegedly perpetrated by companies of Nirav Modi and Mehul Choksi that has hit Punjab National Bank along with other banks has also had its impact on another state owned entity: Life Insurance Corporation. As the shares of three banks, Punjab National Bank, Union Bank of India and Allahabad Bank, and Mehul Choksi-promoted Gitanjali Gems fell sharply over the last few days, LIC, which is the single largest institutional investor in all these four entities has lost nearly Rs 1,400 crore over the last three trading sessions on its investments in these companies. While LIC owns 13.93 per cent in PNB, 13.24 per cent in Union Bank of India and 13.17 per cent in Allahabad Bank, it also owns 2.88 per cent in Gitanjali Gems as on December 31, 2017. 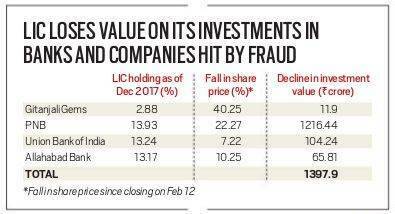 Incidentally, LIC’s holding in all these four entities is the single largest institutional holding and, therefore, it is the biggest loser as an investor in these companies following the crash in share prices after the fraud came to light. Data sourced from Prime Database shows that in the quarter ended December 2017, LIC significantly increased its holding in Union Bank of India and PNB. While its holding in UBI went up from 9.69 per cent in September 2017 to 13.24 per cent in December 2017, that in PNB went up from 12.52 per cent to 13.93 per cent in the same period. The two banks figure in the list of top 10 companies where LIC increased its holding in the quarter ended December 2017. However, in the case of Gitanjali Gems, LIC reduced it holding from 3.49 per cent in September 2017 to 2.88 per cent in December 2017. Market experts say that LIC’s move to raise its holding in PSBs may have been on account of government announcement to recapitalise banks. Over the last three trading sessions, while LIC incurred a notional loss of Rs 11.4 crore on account of fall in share price of Gitanjali Gems, that on account of its holding in PNB and Union Bank of India amounts to Rs 1,216 crore and Rs 104 crore respectively. The loss in value of holding in Allahabad Bank amounts to Rs 65.8 crore. The aggregate loss in investment value for LIC, on account of exposure in these four companies over 11 trading sessions in February amounts to nearly Rs 1,900 crore. While PNB has stated that the fraud on account of letter of undertaking issued to Nirav Modi’s companies amounts of $1.77 billion (over Rs 11,000 crore), other banks also have exposure to it, said a PNB official. It is estimated that on the back of PNB’s LoU, Allahabad Bank and Union Bank of India extended credit amounting to around Rs 4,000 crore and Rs 2,000 crore respectively to Nirav Modi’s companies. As The Indian Express reported today, a consortium of PSU banks lent about Rs 3,000 crore to various firms of Nirav Modi, including his flagship firm Firestar International Ltd. Data accessed by The Indian Express showed that 17 banks lent Rs 1,980 crore to Firestar International — as on June 2015, the most recent date for which data is available. Apart from this, these banks extended another Rs 500 crore in “non-fund based facilities” such as guarantees or LoUs to the company. Of this, Rs 90 crore has been repaid by Firestar International. Other than Gitanjali Gems, LIC has stakes in other listed jewellery manufacturing firms including PC Jewellers (2.18%) and Rajesh Exports (5.04%).